Item #MR-237: 23" long Necklace of 7mm round Lapis Lazuli Beads and 6mm Rondel and 7mm round 14Kt. Yellow Gold Beads with 14Kt. Yellow Gold fish hook clasp. Item #DB-1073: 25" long, Necklace of 7-8mm round faceted Lapis Lazuli Beads of 208.70 cts. TW. 14Kt. Yellow Gold and Lapis Lazuli slide clasp with safety. Knots between beads. Item #DB-2107: 30" long continuous Necklace with one hundred & five 6mm round Lapis Lazuli Beads, seven 5mm round 14Kt. Yellow Gold beads & fourteen 4mm round 14Kt. White Gold beads. Item #DB-1307: 34" long, Necklace of faceted Lapis Lazuli Beads of 352 cts. TW with knots between beads. 14Kt. Yellow Gold fishhook clasp with bead set round Diamonds of .42 cts. TW. 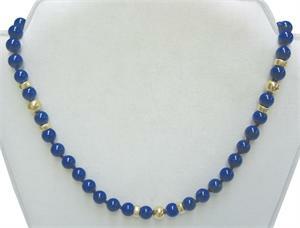 Item #MR-235: 34" long, Continuous Strand Necklace of 10mm round Lapis Lazuli Beads.